This sheet pan tofu stir fry recipe is an easy, all-in-one meal made with tofu, snap peas, and carrots. It’s perfect for weeknight dinners or meal prep! 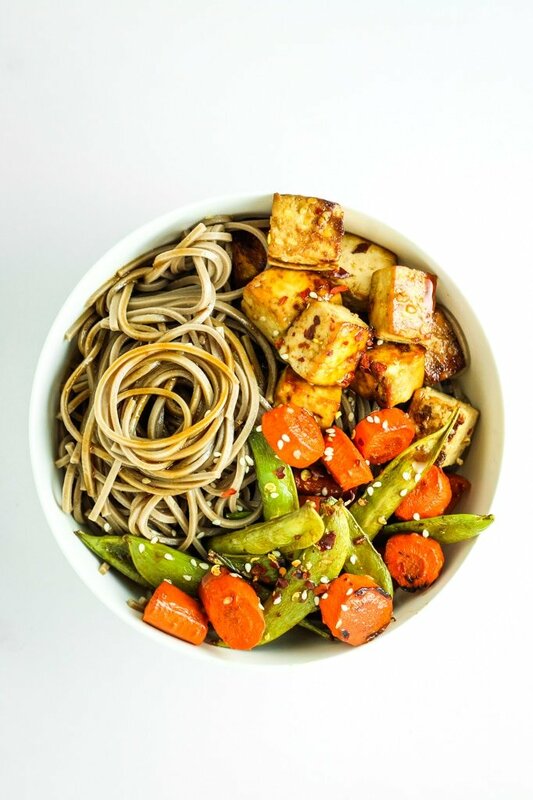 If desired, serve over soba noodles, rice, or quinoa. One pan to cook the dinner. One pan to clean up after dinner. One pan to rule them all. THIS recipe is lazy, easy cooking at it’s finest. Crispy tofu, tender carrots, and crunchy snap peas all in a simple, sticky marinade. How’s your January going? We had our first snow of 2018 in Colorado Springs over the weekend! It was 60 degrees on Friday and we woke up to snow on Saturday morning – go figure.  We used (most of) the snow day to be productive and tested 3 (!) recipes. And then we vegged out on the couch and watched American Made, which I highly recommend. But only if you’re at least somewhat interested in government conspiracies and such. Also – we saw Star Wars at the movies on Friday, which I also recommend. SO much better than the last one. I just need you to know that we went to the 10:20 showing. As in, 10:20 IN THE PM. And I stayed awake for the whole movie. This is a win and I’ve revoked my own grandma card for the time being. It’s been replaced with a nerd card. I definitely never thought I’d be the kind of person who would be into watching Star Wars at all, let alone going to see it in theaters on a Friday night at 10pm. Then again, I also never would’ve guessed that I’d be the type of person with a fridge full of meal prepped veggie lunches. But here I am. 邏 Casually discussing Star Wars and meal prep with you fine folks on a Tuesday afternoon. In all seriousness, this recipe is fantastic. You guys told me via Instagram story polls that you wanted more quick meals, more meal prep ideas, and more veggie dinner recipes in 2018. This sheet pan stir fry checks allllllllll of the boxes! Make this for dinner and share a picture of it on Instagram – we love seeing what you guys create and hearing what you think! Preheat oven to 400ºF. Line a large baking sheet (or two smaller baking sheets) with parchment. Drain tofu of excess water and cut into cubes about 1/2″ square. Add marinade ingredients to a bowl and whisk to combine. 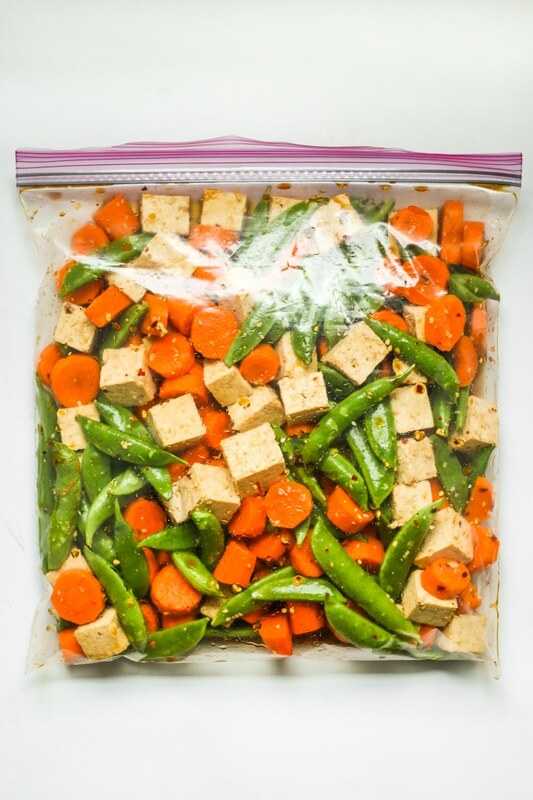 Combine tofu, carrots, and snap peas in a large ziplock bag and pour in marinade. Shake well to coat everything evenly. Pour the tofu and veggies onto the baking sheet and spread evenly. Bake 30-35 minutes, tossing halfway. Serve and enjoy! I cooked 4 oz. of soba noodles to serve the stir fry over – A) because I love soba noodles and B) because it makes the meal go further. Thanks to FabFitFun I was semt the link to this recipe and decided to give tofu a try. This was great! Awesome! I’m so glad you found it and you like it! :) Thanks for your feedback! I absolutely LOVED the recipe and cannot wait to try more! It was easy to make and easy clean up. Absolutely delicious! I love sheet pan meals, and this one looks delicious! Me too! Such an easy option. YES! I’m all about minimal prep and cleanup. Definitely watch American Made ASAP! Wow, I’ve been baking tofu for years but have never made it a sheet pan meal like this! Such a great idea. Will definitely be trying, thank you! You have to try it! So easy and flavorful. I’ve never cooked tofu in the oven but I love the ease of it! I would love to try meal prepping with this recipe. Oh it’s SO good! 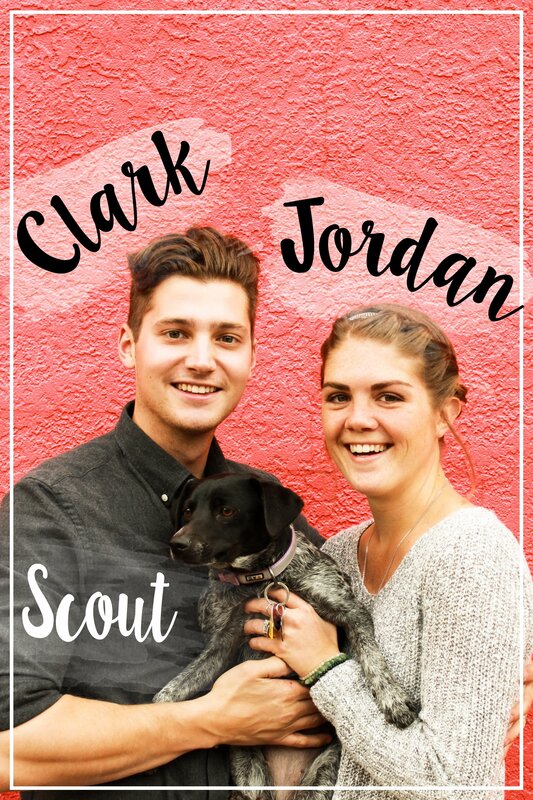 Give it a try and let me know what you think! What a great recipe there! Stir fries are my all time favourite quick dinners, really can’t go wrong with them. Thank you for a great recipe. Stir fries are the bomb! Enjoy. Minimal cleanup is where it’s at! More time for Star Wars lol. I’ve been looking for new stir fry recipes for meal preps so this is perfect! It looks delicious (and healthy) so double win! I am starting to bake meal with my sheet pan, it’s just easy all around. Your recipe looks awesome. Yes! Easy prep, easy to cook, and minimal cleanup. Enjoy! 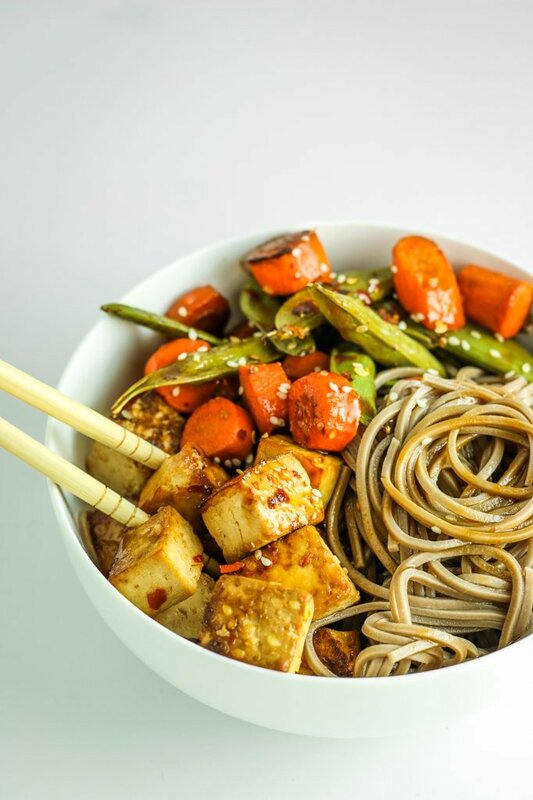 I love tofu as a meat-substitute and this recipe is definitely on my list now! Easy to make and I bet it’s full of flavor! Me too! It’s so inexpensive and versatile. Enjoy! 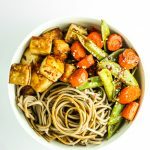 I love how colorful this easy dish is and I think it looks perfect for lunch with the addition of the soba noodles – I love soba, too!